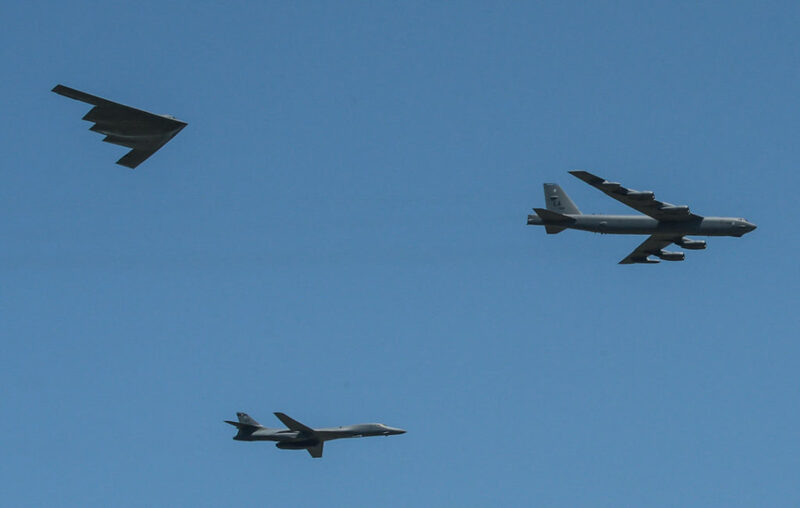 The U.S. Air Force needs more bombers and tankers, Gen. Stephen Wilson, the service’s vice chief of staff, told National Defense for an article the magazine published in December 2018. But with military spending likely to decline following several years of increases, the flying branch could struggle to afford the new planes. In late 2018 the Air Force possessed 159 bombers in nine front-line squadrons. The fleet included 20 B-2s, 63 B-1s and 76 B-52s. At the same time, the Air Force operated around 450 KC-135 and KC-10 tankers in 40 squadrons. When the Air Force reassessed its force structure, especially in light of China’s own growing military capabilities, it concluded bombers and tankers represented “the biggest shortfall,” Wilson said. In September 2018 the Air Force announced it would ask Congress for the money to grow from 312 squadrons to 386 over the next decade. The additional 74 squadrons include five new bomber units and 14 new units flying tankers. The shortfalls are related. Although America’s bombers can fly thousands of miles on internal fuel, they require frequent refueling in order to strike distant targets from their permanent bases in Missouri, Texas and South Dakota. In 2017, two B-2s took off from Missouri and flew for 30 hours, round-trip, to bomb militants in Libya. KC-135 and KC-10 tankers from five bases on three continents refueled the B-2s en route. If you buy more bombers, you must also buy more tankers to support the bombers. As of late 2018, the Air Force was having more success developing a new bomber than it was developing a new tanker. In October 2015 the flying branch tapped Northrop Grumman to design and build at least 80 B-21 stealth bombers for around $500 million per bomber. Over the next three years, the number of B-21s the Air Force said it needed steadily grew. By the time of the Air Force’s 2017 budget request, the requirement was for 100 B-21s. “We require a fleet size that will ensure sustained dominance well into this century and intend to procure a minimum of 100 B-21s,” the Air Force explained in a budget document. The B-21s would replace B-2s and B-1s in the 2030s, the Air Force announced. The service said it would upgrade many of the B-52s in order to maintain an overall fleet of around 160 bombers. Wilson’s comments indicate the Air Force’s changing thinking, if not the precise details of its bomber plan. To add five squadrons, the Air Force could buy 200 B-21s and retire all the older planes. Or it could acquire fewer B-21s while keeping the B-2s, B-1s and B-52s longer. The vice chief of staff praised the small, secretive organization overseeing the B-21’s development. “I’ve talked at length in multiple forums about what makes the Rapid Capabilities Office so successful,” Wilson said. The service’s has had less luck, and has fewer options, when it comes to expanding the tanker fleet. The KC-135s that account for more than 80 percent of the tanker force all are more than 50 years old. The KC-10s, while newer, are unreliable. The Air Force first proposed retiring the 58 KC-10s in 2014, but has delayed disposing of the type until the new KC-46 is ready. But Boeing has struggled to complete development of the KC-46. After several delays resulting from design problems, the company planned to deliver the first operational examples of the new tanker some time in early 2019. The Air Force wants 179 KC-46s to begin replacing older tankers at a price of around $250 million per plane, including development costs. It likely won’t get easier for the Air Force to afford new aircraft, potentially jeopardizing the expansion plan. Struggling with skyrocketing budget deficits resulting from deep tax cuts it championed in 2017, the Trump administration in late 2018 asked the military to cut $33 billion from the $700 billion it expected to request for 2020. This story originally appeared at The National Interest.